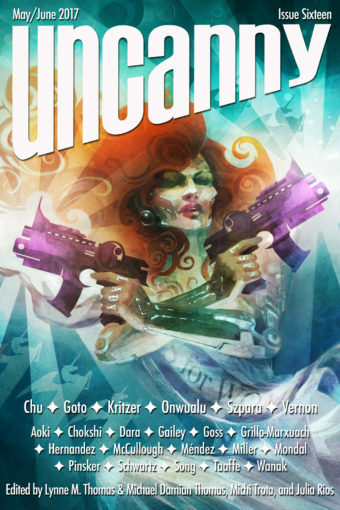 Welcome to Uncanny Magazine Issue Sixteen! All of the content will be available for purchase as an eBook (PDF, EPUB, MOBI) on May 2, 2017. The free online content will be released in 2 stages—half on May 2, and half on June 6. Featuring all-new short fiction by Ursula Vernon, John Chu, Chinelo Onwualu, Naomi Kritzer, Hiromi Goto, and K.M. Szpara, reprint fiction by Carlos Hernandez, nonfiction by Javier Grillo-Marxuach, Sarah Gailey, Sam J. Miller, Sarah Pinsker, Mimi Mondal, David J. Schwartz, Kelly McCullough, LaShawn M. Wanak, Yamile Saied Méndez, and DongWon Song, poems by Roshani Chokshi, Sonya Taaffe, Betsy Aoki, and Theodora Goss, interviews with John Chu and Hiromi Goto, and Galen Dara’s “The Nas*T* Lady Doth Persist” on the cover. Episode 16A (May 2): Editors’ Introduction, Ursula Vernon’s “Sun, Moon, Dust” as read by Amal El-Mohtar, Roshani Chokshi’s “Dancing Princesses” as read by Erika Ensign, and Julia Rios interviewing Ursula Vernon. Episode 16B (June 6): Editors’ Introduction, Naomi Kritzer’s “Paradox” as read by Erika Ensign, Theodora Goss’s “Seven Shoes” as read by Amal El-Mohtar, and Julia Rios interviewing Naomi Kritzer. Galen Dara has created art for Escape Artists, Uncanny Magazine, 47North publishing, Skyscape Publishing, Fantasy Flight Games, Tyche Books, Fireside Magazine, Strange Horizons Magazine, and Lightspeed Magazine. 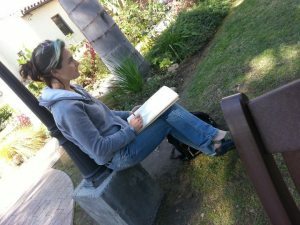 She won the 2016 World Fantasy Award for Best Artist and has been nominated for the Hugo, the Chesley Award, the Locus Award, and the Spectrum 24 Award. When Galen is not working on a project you can find her on the edge of the Sonoran Desert, climbing mountains and hanging out with a friendly conglomeration of human and animal companions. Her website is www.galendara.com. You can follow her on Facebook, Instagram and Twitter @galendara.